I made these mini quiches for a family picnic a month or so ago and everyone loved them so much! Some how making individual 4'' quiches makes them more special, but hey if you haven't got the time or the cases you can make one large quiche in a flan dish and it will taste just as delicious! In a bowl incorporate the margarine and salt into the flour. Rubbing between your fingers until it resembles breadcrumbs. Then add your water and bring together to form a dough. You may need more water for it to come together so add another tbsp or so until you have a dough that cleans the bowl. Grease and flour your tins then roll out the pastry and lay over the tins gently pressing into each one and then use a knife to trim any excess pastry. Using some parchment and baking beans (you could use dried beans, lentil or rice if you don't have baking beans) blind bake the pastry for 20 mins in a 200c oven. Next in a bowl add the tofu and break up into small pieces with a folk. Next add the nutritional yeast, egg replacer, herbs, lemon juice, mustard and salt and pepper and mix well to combine. In a frying pan add the olive oil and onions. Fry gently until translucent. Then add the broccoli florest and fry for a further 5-10 mins just to gently colour the broccoli. Remove the pastry cases from the oven and spoon in the onion and broccoli mix evenly into all the tins. Then spoon over the quiche mix and spread it evenly in the case. Then place a couple of tomato halves on top. Place in a hot oven and cook for a further 15-20mins at 200c until golden brown. I've still yet to embrace the world of vegan quiche but this looks like a great recipe to start with. Bookmarking it. You've got me inspired, I'm going to make quiche later today I think! I looooove quiche and you're so right about the mini-ness of them making it feel more special! I'll be trying these soon, haven't had a quiche in years! I remember really loving broccoli quiche (and most quiches for that matter!) in my pregan days, but strangely my experiments have been fitful since then - I really like the look of this recipe. It looks both doable and tasty, and you can't ask for more than that! To Order Cakes, Visit Our Website! 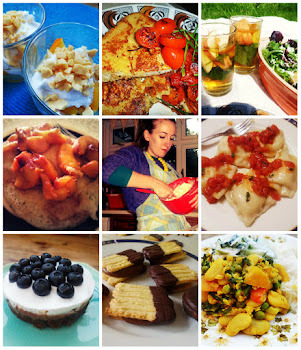 Last Day of Vegan Mofo 2013 Recap! My Week According To My Camera!